Conroe consists of tall pinewood trees and lush foliage. The beauty of the city’s less urbanized, country-like appeal is what has attracted so many to this area. Land clearing in the Conroe area often requires tree and stump removal, brush mowing and under brushing, as well as debris clean up and demolition work. It’s best to entrust these tasks to a crew that knows what they’re doing and can deliver exceptional quality within the time needed. 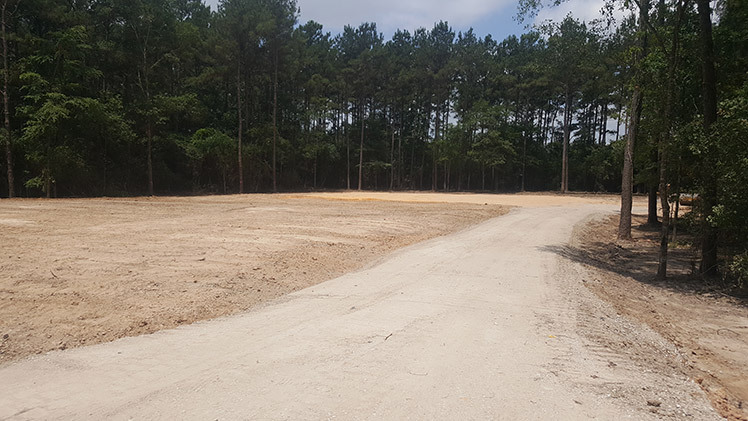 We guarantee total satisfaction in our Conroe Texas land clearing service as our crew is readily available to service any area you may need taken care of effectively and efficiently. We make sure your land is workable, safe, and ready to serve as the foundation for your project. You don’t want just anyone working on your land. At Texas Ace Land Clearing, we believe high-grade land clearing jobs in Conroe begin with a quality crew of machine operators. We provide land clearing servicemen who have years of experience under their belt as well as insight into specific characteristics of each area we service. We understand that a critical component of land clearing, even more than the equipment enlisted, is the deliverance of efficient communication. We keep our clients well informed about every aspect concerning their lot and how the job is coming along. Our goal is to make sure that our clients are well informed about their land clearing project as this enables us to build trust with our customers. Our Conroe customers know exactly what work is being done on their land and are informed of all moves made by our land clearing crew. And services of the like. Don’t allow just any old land clearing company in Conroe to take care of your land. In choosing Texas Ace Land clearing, you’re choosing a quality land clearing job by servicemen who value 100% customer satisfaction. Our land clearing works are second to none in fulfillment. We not only carry high-end equipment with which we use to deliver superb results, but our land clearing servicemen remain faithful in keeping customers in the loop. We aren’t satisfied with a land clearing project until our customers are. You’ve got a construction project you want to complete. We ensure that your land is ready and able to undergo its next steps. We aren’t big talkers. Our customers say it all. Land clearing is more than a job for those that contain the “best equipment”. If the machine operators aren’t skilled in handling the land they do, the kind of job you can expect with that equipment is as mediocre as their skill. Our land clearing machinery is superb, and our experienced land clearing machine operators are even better. With Texas Ace Land Clearing, you get more than what you sign up for. We ensure that your Conroe land is as ready you are to get building. Entrust your land to Texas Ace Land Clearing and expect to start building soon after. If you have any questions regarding the land clearing in Conroe TX we offer here at Texas Ace, give us a call!